Uniform: CAP promotes teamwork and high standards of personal conduct by granting cadets the privilege of wearing an Air Force-style uniform. The uniform, and the related tradition of rendering military customs and courtesies, distinguishes cadets from ordinary youth. These military aspects of cadet life motivate cadets. 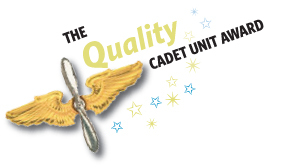 Opportunity to Lead: CAP develops leadership skills in cadets by giving them opportunities to lead. This includes planning events, making decisions, and teaching and mentoring junior cadets, depending on how far they have advanced in the program. The cadets’ grade structure and military-style chain of command reinforces this leadership concept. Aerospace Theme: CAP members hold in common a love of flying. Aviation is the thread that runs through all three CAP missions. Our affiliation with the Air Force underscores our identity as an air-minded organization. Challenge: CAP challenges youth. It might be the physical challenge of conquering an obstacle course, an academic challenge to master aerospace and leadership concepts, a moral challenge to live the Core Values, or a personal challenge to know oneself better and gain self-confidence. Because of these challenges, the Cadet Program is for young adults, not children. Fun: CAP is supposed to be fun. Cadet life is marked by new friends and great opportunities. Proper adult supervision, a pro-safety attitude, and teamwork built around mutual respect keep the cadet experience enjoyable. Physical Fitness: CAP is devoted to developing the entire leader. This include personal health in terms of fitness. Cadets will participate in physical activities at most meetings, and fitness test every three months.